This rug is darling. I have it in a bedroom between twin beds. If you love the shabby chic look you will love this. The quality is good and I love the scalloped edges. Glad I made this purchase. Safavieh Monaco Vintage Floral Bouquet Ivory / Pink Rug - 5'1" x 7'7"
Featuring an eye-catching floral design, this Hand-hooked Sweet Rose/ Pink/ Green Rug will fill your interior decor with style. Available in pink, this rectangular rug has a hand-hooked construction using cotton for a plush pile. This collection of nursery room baby rugs are designed in playful colors and patterns. 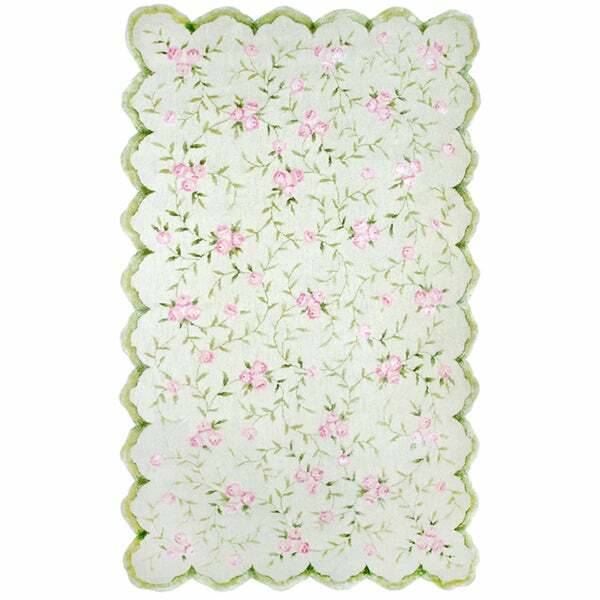 Classic and versatile, they make the perfect blend of style and comfort just like this Sweet Rose Rug. This is one of the most beautiful rugs I own. I have it in my master bedroom at the foot of the bed. It is so soft and the colors are true to the picture. You won’t be disappointed buying it! Better than expected. Good quality and goes so perfectly with my guest room decor!! Very pleased. Very well made. Just what I’ve been looking for, great price. "Is the background color of this rug white or light green?" The backgroun color is light green, in our opinion. Color is open to interpretation. Please remember, due to the difference of monitor colors, the colors on some of our items may vary slightly. Thank you. Safavieh Daytona Cream/ Blue Polyester Rug - 5'1" x 7'6"